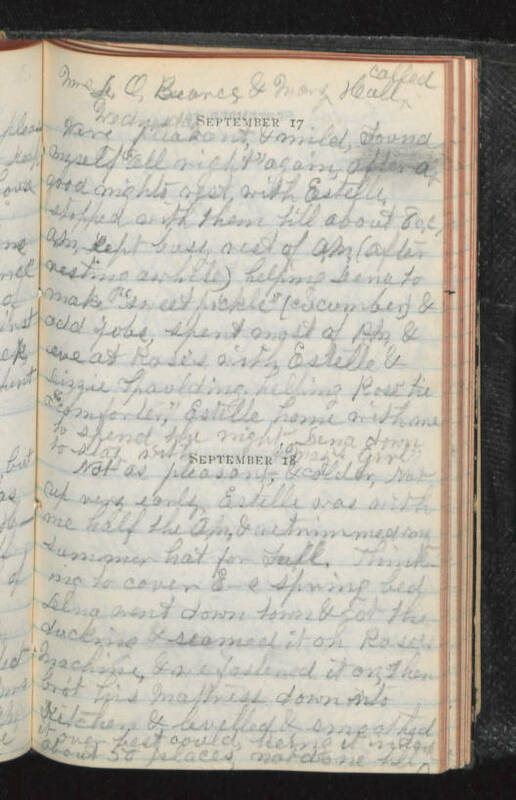 Mrs O, Beance & Mary Hall called Wednesday September 17 Very pleasant, & mild, Found myself "all right" again, after a good nights rest, with Estelle stopped with them till about 8 o,c, A.M. kept busy rest of A.M. (after resting awhile) helping Lena to make "sweet pickle" (cucumber) & odd jobs, spent most of P.M. & eve at Rose's with Estelle & Lizzie Spaulding, helping Rose tie "comforter", Estelle home with me to spend the night. Lena down to stay with "May's girl" September 18 Not as pleasant, & colder, nor up very early, Estelle was with me half the A.M. & retrimmed my summer hat for Fall. Thinking to cover E_s spring bed Lena went down town & got the ducking & seamed it on Rose's machine, & refastened it on, then bro't his mattress down into kitchen & leveled & smoothed it over best could, tieing it in about 50 places, not done till dark.